Immunization Requirements. Meadowsweet Pet Boarding and Care. Wilmington, N. C. 910/791-6421 Boarding dogs, cats, puppies and kittens. 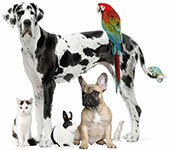 MeadowSweet's immunization requirements are for the welfare of your pets as well as our other guests. Dogs boarding at MeadowSweet are required to be currently immunized against Rabies, DHLP, and Bordetella and follow up Bordetella immunization every 6 months or as recommended by your veterinarian. MeadowSweet recommends that all dogs frequenting a boarding facility have a Bordetella vaccination at 9-12 weeks of age, a booster at 15-19 weeks of age and follow up Bordetella immunization every 6 months. Because vaccinations may not be fully effective for 7 days from the date of injection, MeadowSweet recommends that all required immunizations be given at least 1 week prior to boarding. Cats staying at MeadowSweet are required to be currently immunized against Rabies and FRCPP. Immunization against Feline Leukemia is required for cats that spend any time outdoors. We strongly recommend that you consult your veterinarian, prior to your scheduled boarding dates, to ensure that your pets are up to date on required immunizations in order to avoid any problems at check in. While MeadowSweet may be able to assist in obtaining vaccination information for your pets, it is the owner's responsibility to ensure that your pets are current on all required vaccinations and that MeadowSweet has been provided with proof of these immunizations prior to your pet's) stay with us. Your veterinarian can fax or mail vaccination records to MeadowSweet. Or you may choose to drop the records off at our office, during regular business hours, prior to your pet's stay with us.